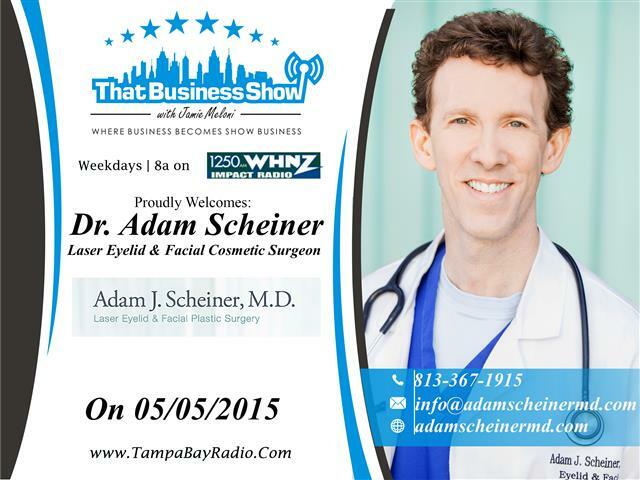 Today on That Business Show, I spoke with world renowned laser eyelid and facial cosmetic surgeon, Dr. Adam Scheiner. Dr. Scheiner is a local Doctor that attracts clientele from around the globe for his unique and revolutionary procedure for the treatment of festoons. Festoons, or malar bags, are unsightly defects under the eyes of some people that are a build up of fluid and fat and come about due to a variety of inputs from genetics to most notably sun exposure. They have been difficult to treat but Dr. Scheiner’s laser procedure that he developed and perfected has given him attention across the globe for the treatment of this condition and has gotten him featured on Dr. Oz as well as the Howard Stern Show and many other media outlets for this procedure. This is a great show with lots of information focusing not only on the procedure for Festoon treatment but we also touch on eye bags in general and their causes and basic non-surgical treatments for them. Dr. Scheiner is also the author of The True Definition of Beauty in which he delves into the topic of the importance of non-verbal communications and how important the appearance of one’s face is in everyday communications, conveying messages we may or may not mean to convey just by our natural appearances. His book also discusses this cosmetic procedure and how to know if cosmetic surgery to correct this issue is for you and shows many of the before and after success stories he has been involved in. Dr. Scheiner also works with patients on a variety of other procedures from Botox to the 5 minute nose job and we touch on some of these procedures and their benefits briefly throughout the last segment. Dr. Scheiner was also kind enough to offer a free consultation to anyone who mentions that they heard him on my radio show today for any of his procedures, a $150 value. Learn more about Dr. Scheiner and his practice and procedures at http://www.adamscheinermd.com and contact his office for a free consultation (be sure to mention the radio show) at 813-367-1915!